Discover the ultimate way to enjoy all the magic of Walt Disney World Resort. With the help of your own VIP Tour Guide, groups of up to 10 persons can maximize their fun with minimal fuss for the Disney holiday of a lifetime! Simply tell your VIP tour guide what you’d like to see and they’ll customize your day around you - so you can relax, unwind and enjoy every moment of your visit. Hang on to your hats as you ride some of the fastest attractions at Walt Disney World Resort or perhaps enjoy a day of classic Disney attractions in Magic Kingdom – the choice is yours! With special perks like door-to-door transportation from your Orlando accommodation, preferred viewing areas for Shows, Parades, and Nighttime Spectaculars and direct access to all FastPass+ return queues for expedited entry to the rides, you'll spend less time waiting and more time soaking up the magic of Walt Disney World Resort. Services of a Disney VIP Tour Guide for up to 7 hours. Direct Access to all FastPass+ Return Queues for attractions. Reserved Viewing Areas for Shows, Parades, and Nighttime Spectaculars. Private round-trip transportation to and from your Orlando accommodation and the Walt Disney World Resort. Once booked and confirmed the VIP tours are not refundable. The Disney VIP Tour can only be booked up to 180 days in advance. Tours are on a request basis and dates are subject to limited availability. Upon receiving your booking we will book your date with the Disney VIP Tour Team. Should your chosen date not be available, alternative dates will be offered. If none of these alternative dates are suitable, your booking will be cancelled and refunded in full. 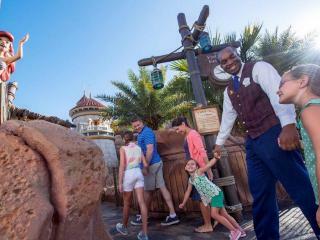 VIP Tour hours commence at the pre-scheduled meeting time and location stated on the Disney VIP Tour Ticket, regardless of whether guests are late for their meeting time. Tour price is in addition to park admission, a separate entrance ticket to Walt Disney World Resort will still be required.